A diaphragm seal makes measuring pressure safer and more reliable – even in extreme working conditions – and is ideal for protecting pressure instrumentation and process transmitters. Discover the basic principle behind diaphragm seals and when to use them. It often isn’t a problem when the process medium comes into direct contact with a pressure instrument. However, harsh media and environments can damage an instrument’s internal pressurized parts. In these instances, a diaphragm seal can make all the difference between reliable and unreliable readings. The purpose of a diaphragm seal is to isolate a pressure measuring instrument from the process media. It is often used for the most difficult measuring tasks, such as when the environment is extremely hot or cold, or when a process connection is difficult to attach to the measuring instrument. Diaphragm seals are also used when the media being measured is corrosive, viscous, sticky, or easily solidified, or when the process isn’t chemically compatible with the instrument material. A diaphragm seal is a thin, flexible wall that separates the media being measured from the pressure measuring instrument. 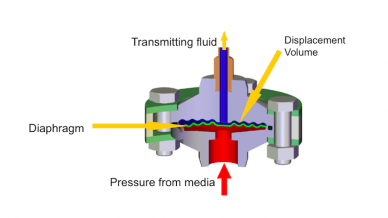 Typically connected to a pressure gauge, process transmitter, or pressure switch, a diaphragm seal is a thin, flexible wall that separates the media being measured from the pressure measuring instrument. The space between the diaphragm and the measuring instrument is filled with a system fluid (transmitting fluid), which hydraulically transmits pressure from the flexible diaphragm. The contact surface between the media and the diaphragm is relatively large, which ensures more accurate pressure measurements – especially for very low pressures (< 600 mbar). When using a diaphragm seal, the measuring instrument can be used at temperatures from −130 to +750°F (−90 to +399°C), as well as with aggressive, corrosive, heterogeneous, abrasive, highly viscous, or toxic media. There are diaphragm seal designs, materials, and filling fluids available for many demanding industrial applications, such as bioethanol production, fertilizer production, and wastewater filtration. A properly engineered diaphragm seal protects while only minimally affecting accuracy. As such, diaphragm seals extend the operating life of pressure measurement instruments – saving users significant time and money in the long run. Diaphragm seals also enable remote mounting from the pressure port via a capillary that is custom suited for your unique application. And thanks to the wide range of available process connections (flanged, threaded, etc. ), they can meet many industry standards. Many customers have come to appreciate WIKA’s diaphragm seal service, which has gained quite a reputation in the Gulf Coast for returning diaphragm seal repairs in less than 24 hours. The seal repair service is also a great way to save money by repairing or replacing only the damaged pieces rather than buying a completely new transmitter assembly. We make repairs on any make or model of diaphragm seal on any transmitter, regardless of the original manufacturer. For more information about WIKA’s comprehensive Diaphragm Seal Division, contact our pressure experts.